Members of the Missouri National Guard, including Maj. Craig Gatzemeyer of Millersville (center), competed last on March 21 at the Bataan Memorial Death March in New Mexico. WHITE SANDS MISSILE RANGE, N.M. -- Epitomizing the "spirit of Bataan," Missouri National Guard teams were among the top finishers at the 21st annual Bataan Memorial Death March last weekend, with each team finishing in the top three in their respective categories, including one for first place. But when the harrowing 26.2-mile trek through the stifling New Mexico desert was over, all the Missouri Guardsmen wanted to talk about were what they described as the real heroes of the day -- the veterans of World War II's infamous Bataan Death March. "This was nothing compared to what they went through," said 1st Sgt. Shannon Wilde of Jefferson City's 138th Infantry Battalion's Forward Support Company. "This was a very taxing event for us and it's a brutal course. There was nothing easy about it. But I don't think there's any way to really comprehend what those men went through." More than 5,700 people from around the world -- including military members and civilians -- participated in the 21st annual event, which honors the veterans of the battles of Bataan and Corregidor during World War II in the Philippines. In 1942, Japanese captors forced 78,000 prisoners of war, including 12,000 Americans and 66,000 Filipinos, to march for six days on the Philippine island of Luzon to a prisoner-of-war camp in what has become known as the Bataan Death March. Little or no food or water was provided to the POWs, who were subjected to beatings and executions along the way. As many as 11,000 prisoners died during the march. Participants in the memorial march included three Missouri National Guard teams and several Missouri Guards Soldiers who participated as individuals. All of the teams finished strong, at or near the top of their categories. In the National Guard light team category, the Missouri Knapp-Sackers took home first place, with a time of 5 hours and 40 minutes, beating out three other teams in their category. In the National Guard's heavy category -- meaning these competitors wore ruck sacks weighing 35 pounds -- the Missouri Guard team finished second out of nine, with a time of 6 hours and 15 minutes, which was just a little more than a minute behind the first-place team in that category. In the category of military co-ed light, the Missouri Guard team finished third out of 25 teams, with a time of 6 hours and 58 seconds. All of the Missouri Guard participants marched or ran in their full Army combat uniforms, including their boots. The teams were named for Missourian Frank Knapp, who served in the Missouri National Guard and endured the notorious Bataan Death March. Knapp, who served in St. Joseph's 35th Tank Company, survives and is 89. The military co-ed light team was named "Rudd's Remembrance," for Neilson Rudd, a Missouri National Guard officer candidate who was struck and killed by a car while trying to help a motorist along U.S. 63 near Jefferson City in 2007. The participants at the memorial march trekked near the base of the Organ Mountains, alternating between the dirt roads of the missile range and old blacktop roads. They navigated an area known as "the sand pit," which offered some of the most challenging terrain of the entire course. Dirt roads gave way to steep-banked arroyos filled with ankle-deep sand. The participants also huffed their way up a seemingly never-ending steep hill, which was tucked away among the remnants of mining claims scattered along the hill's base. Capt. Alan Brown, command historian for the Missouri National Guard, was the team leader for the first-place finishing light team. Brown, a marathon runner at age 46 from Jefferson City, has participated in the event once before two years ago. "It went real well," Brown said. "That was real pleasing, to come in first. It's a special event and we wanted to do our best and represent the Missouri National Guard. We gave it our all." Still, Brown said, the day for him and those of his team was really about honoring the survivors, many who attended the event. "This is about honoring their legacy," Brown said. "They were the sheer definition of the American Soldier. This is better than a marathon. This is a good cause and that's what makes it special." Maj. Craig Gatzemeyer, who lives in Millersville and serves as the training officer of the 70th Troop Command, was the team captain for the second-place heavy team. Gatzemeyer participated in the event this year for the fifth time. While the competition is enjoyable, Gatzemeyer said he continues to participate because he wants to honor the veterans who survive and those who have died in the years since. "If you go one time and hear these tributes to the Bataan Soldiers and hear them do roll call, it's really special," Gatzemeyer said. "You see these survivors and shake their hands and read about the struggles they went through, you just can't wait to go back next year. It gets more significant each time." 2nd Lt. Noah Poeling, team captain for the third-place co-ed light team, told his team not to look at it like a race, but more of an experience. "It's meaningful for us to go and hear stories and hear about those men's sacrifice," said Poeling, who serves with 35th Special Troops Battalion Company A in Kansas City, Mo. 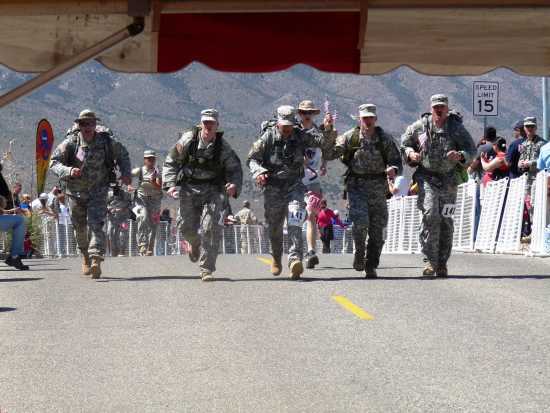 "The course really tested some of my Soldiers limits, but my team persevered and we finished. My team did a great job." Spc. Jennifer Boutelle of Mokane, Mo., was one of two females on the Missouri National Guard co-ed team. She said her hip flexors and calves locked up at several points during the march, but she wasn't about to give up. "The march was not easy," she said. "It was hard. But my team-mates really helped motivate me to keep me going. I thought about the sacrifices the veterans at Bataan made, so I knew I couldn't give up. What we did doesn't even come close. But when we crossed that finish line and those veterans were waiting to shake our hands, I don't even have the words for it. I'm glad I was a part of it because it's so much bigger than me."